BMI Certified IQ Test - Take the most accurate online IQ Test! 3. What I get when I complete the Test? 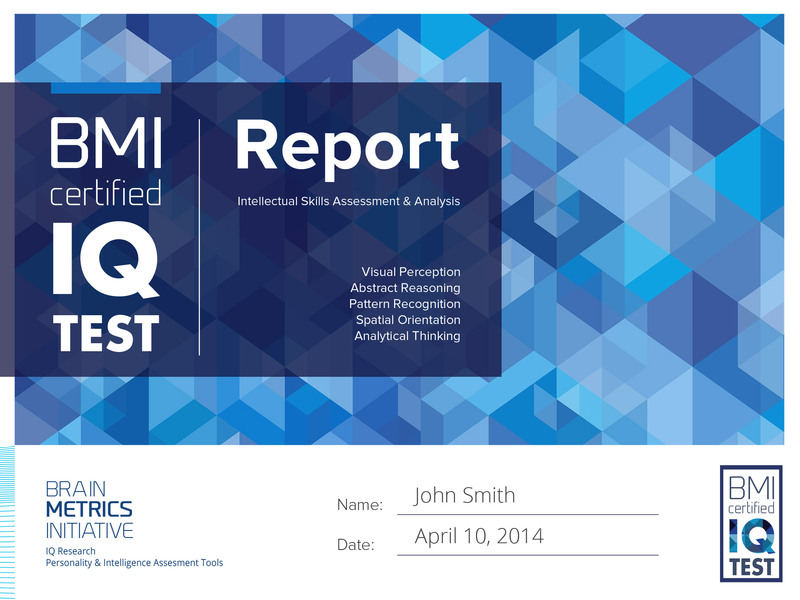 The BMI™ Certified IQ Test 2017 is the most up to date version of our certified IQ Test, created by experts in the IQ Research field.It is a highly accurate tool specifically designed for measuring general intelligence in online environments. abstract reasoning, pattern recognition, analytical thinking, and spatial orientation. Answers analyzed and scored accordingly to each question’s difficulty; some questions are more difficult than others and are worth more points. BMI IQ Test™ is a timed test and it is scored automatically after 20 minutes. It usually takes 10 to 15 minutes to complete and you immediately get your IQ Score, your personal IQ Certificate from BMI and an extensive Report on your intellectual strengths and weaknesses. 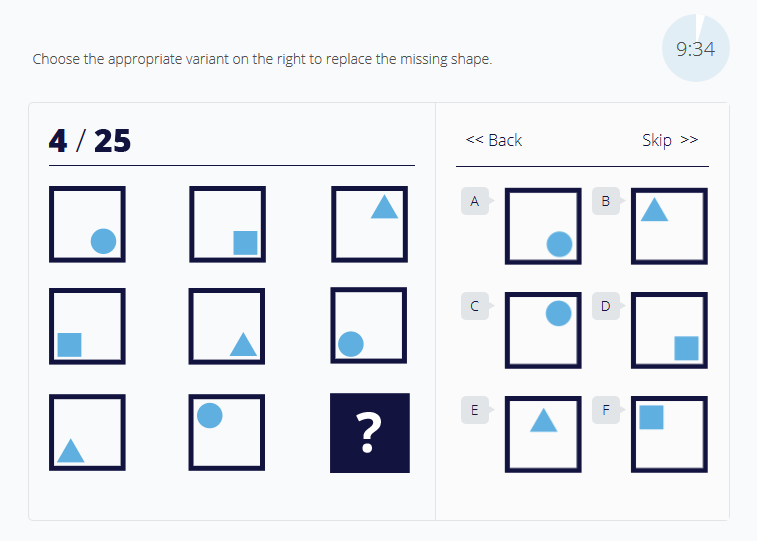 You can have a look at a sample question from the BMI Certified IQ Test™ or try the free IQ Test demo to familiarize yourself with it before taking the full version of the test. 2. 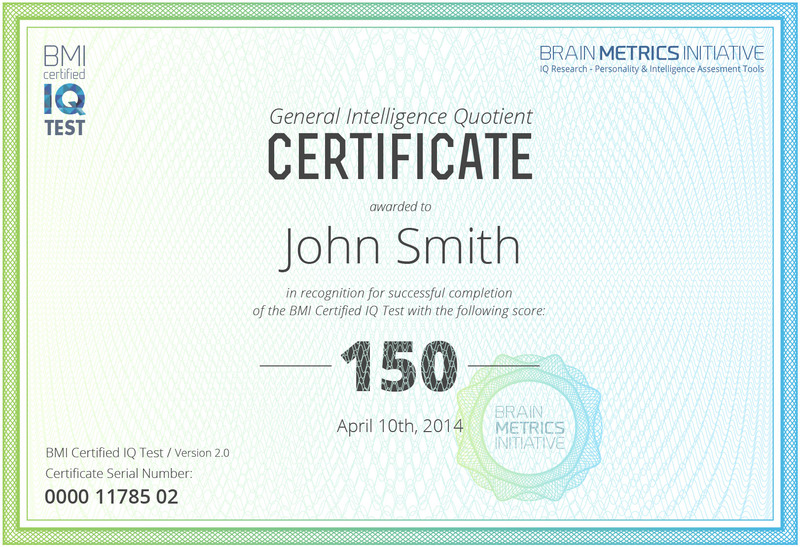 WHY TO TAKE THE BMI CERTIFIED IQ TEST? Take the BMI Certified IQ Test™ to discover your true intelligence potential and see where you rank among other high intelligence peers. Our researchers have successfully created a quick and simple IQ Test for the year 2017, that is fun to take and at the same time remains highly advanced and reliable. Our IQ Test can help you discover your mental strengths and weaknesses and identify areas that you need to work on in order to improve your IQ score! a. 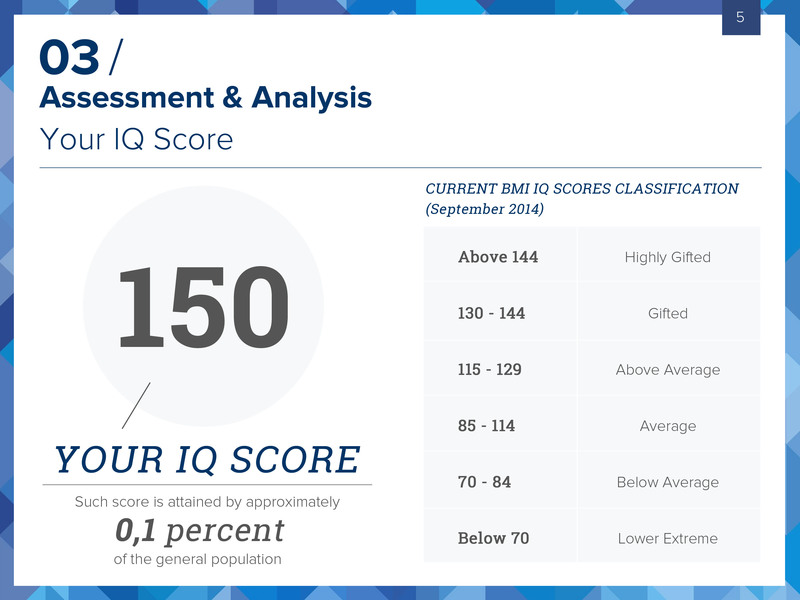 Your IQ Score: Your answers are analyzed and scored accordingly to their difficulty and your final score is calculated with the use of a unique BMI algorithm. Your IQ Score is a reliable estimation of five different areas of your cognitive skills at the time you took the test. b. BMI™ Certificate: BMI Certificate: The certificate is issued in your name and it confirms your performance in the Test. The certificate comes in high resolution PDF format and includes a BMI watermark and unique serial number to ensure authenticity. 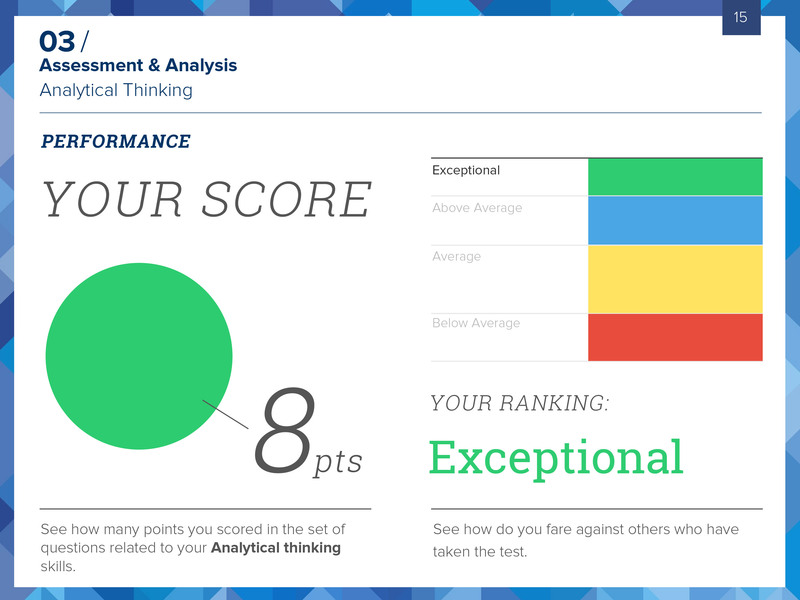 c. A Personalized Report with detailed insights on your brain’s strengths and weaknesses: The BMI Certified IQ Test™ results come with a personalized Report that identifies your key cognitive skills that might need improvement, along with useful tips on how to improve your intelligence score. 4. HOW TO TAKE THE TEST? 1. The IQ Test is comprised of 20 questions that should be answered within 20 minutes. The test will be automatically scored after 20 mins and cannot be paused in between. So make sure that you have 20 minutes available before you start. 3. You can skip questions and return back to them later. Click Finish Test when you are done.